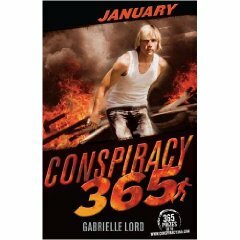 The title of Conspiracy 365: January tells you much about the future plans for the franchise; a series of twelve books, to be released once a month, that pace an extensive narrative across the period of an entire year. The mode of storytelling, with a specificity geared towards time and location, is distinctly reminiscent of television series 24 – a programme widely inaccessible to the book’s target audience on account of the mature themes present. While Conspiracy itself never shies from darker material (including shark attacks, kidnapping, and a young girl beaten into a coma) these acts are dealt with sensitively for the benefit of younger readers without ever losing their impact, and overall combine with likable characters to create a fun experience for early teens. The January edition of Conspiracy 365 is a promising debut for the series, with plenty of action, mystery, future potential, and only very few niggling issues. At some points in the story, the ‘time-shift’ element feels a little gimmicky, and is sometimes poorly deployed. There are occasions early on in the book where the time is established as having progressed by x amount of minutes, yet these changes sometimes occur between simple descriptive paragraphs, rather than signifying an important point in the narrative. Instances where tension is created through a necessity to act quickly are also undermined by shifts forward of up to twenty minutes; however, it is unlikely that a younger audience will mind this too much. It should also be noted that these discrepancies fade as the novel progresses, and in fact go on to function very effectively in portraying the lack of activity in the protagonist’s life once he becomes isolated from the world. There are a series of prints of ‘actual’ letters, or brain-teasing drawings, that Cal is receiving from his father, which provide a welcome, interactive touch to proceedings. If you recall the television mystery series Jonathan Creek or, to remain within the same medium, the Osbourne Puzzle Books popular in the mid 1990s, then the appearance of these visual puzzles is very much evocative of those, where the viewer/reader is encouraged to participate in the narrative by attempting to solve clues themselves. I have to admit even I had a try, and although I was way off the mark when the first clue was revealed, I still found it fun to try! Admittedly, the plot device of Cal’s father having only been able to draw pictures relating to what he was thinking as his mind deteriorated from sickness is perhaps a touch contrived but, again, this is unlikely to trouble Conspiracy’s target audience too greatly. All in all, Conspiracy 365: January is a fast-paced, exciting opener to the franchise. A combination of anxiety, danger, and espionage work constantly to hold the reader’s attention, while a series of interactive puzzles and seemingly prophetic dreams build genuine anticipation towards the next instalment.